Basketball NI would like to congratulate NI Knights and particularly player coach Jason Kennedy who won MVP of the game. Below is the game review from Basketball Ireland but click here for more information on the Knights, click here for the game stats and click here for the BI coverage of the cup weekend. 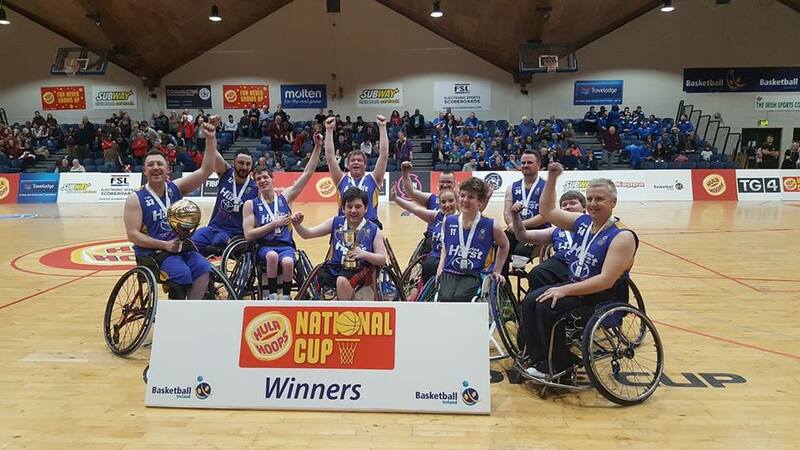 A ruthless fast break and the sharp shooting of Jason Kennedy ensured NI Knights raised the Hula Hoops IWA National Cup for the first time with an 80-51 win over Fr Mathews at the National Basketball Arena. Fr Mathews opened the scoring through good work from Adam O’Neill before Kennedy got Knights’ primary weapon up and running. The player coach had five assists in the first quarter alone including a tee-up for Conn Nagle to drive to the elbow and set the northerners on a 9-0 run. Paul Ryan leant back in his chair to create an opening and snap the streak for Mathews while Derek Hegarty put in a massive shift under both baskets. The cost was three fouls in ten minutes but the overall contribution included two baskets in the low post and a crucial stop on another Kennedy pass over the top. Conn Nagle was at the scoring end of Knights’ superb transition and helped himself to nine points for the period and his side to a 19-11 lead. Knight’s cushion aside, there was little to separate the sides in the second quarter. Adam O’Neill banked in a long two and Hegarty followed up with a steal to reduce the gap to 10 points. The Corkmen’s shooting stats were creeping up but NI Knights consistently made the right choices to shoot at 55%. The only three-point attempt of the first half came on the buzzer for half time and it graced the net to give Knights a 43-28 advantage. Kennedy was the man who let fly to hit the 20 point mark in 20 minutes of basketball. Dylan McCarthy got things going for Fr. Mathews in the third. Adam O’Neill followed up and the Knights needed to beef up their defence to maintain control. Martin McGrath got the stop they needed while Nagle’s speed and timing for the outlet pass left him uncatchable. Jack Quinn’s crisp passing and Alan Dineen’s combativeness weren’t enough to offset the accuracy of Jason Kennedy – He was on 31 points before he allowed himself a breather. Fr Mathews by no means looked a beaten docket but foul trouble forced Hegarty and O’Neill to be cautious and the efforts of keeping pace with Nagle were taking their toll. Fr Mathews: Derek Hegarty* (17), Alan Dineen*, Adam O’Neil* (15), Paul Ryan* (8), Dylan McCarthy*, Alex Hennebry, Chloe Ryan, Michael O’Donoghue, Jack Quinn.